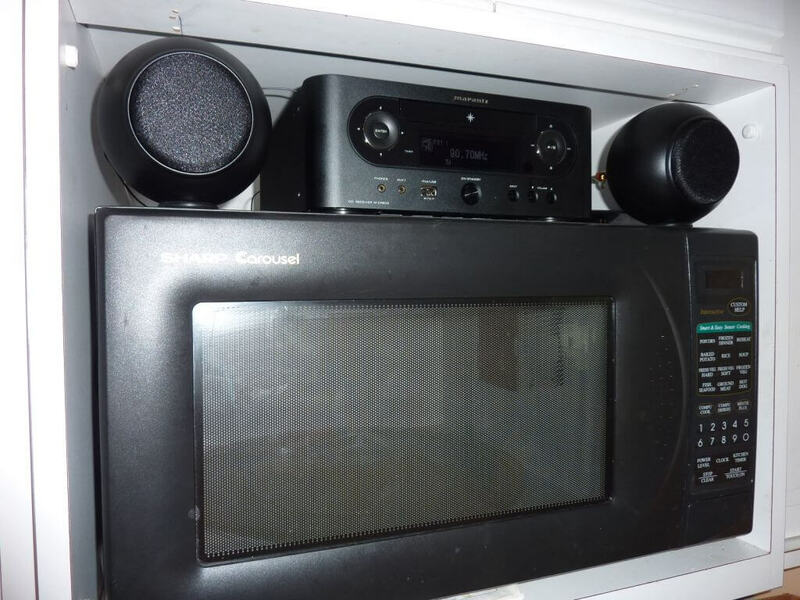 My wife wanted a nice stereo in the kitchen. She wanted FM radio, a CD player and access to the network for iTunes, Internet radio and Pandora. She also wanted to preserve all her cabinet space. I really wanted to get it for her. A dozen schemes came and went, all scuttled by lack of space and my wife’s dislike of wall and ceiling mounted speakers. I found only one little bit of free space – a 5″ x 25″ slot over the microwave. That was my 100 square inches. My solution was a Marantz network receiver and Gallo Acoustics speakers. For speakers I chose the new Gallo Acoustics A’Diva SE ($329 each), just arrived at Gallo this month. The A’Diva SE has a much larger magnet than the previous A’Diva, and a flat honeycomb cone. As much as I admired the previous A’Diva Ti, I found the SE to be a clear improvement. They look too small for people to believe they are good. They usually need a subwoofer to handle sound below 100 Hz. I couldn’t find a sub that would fit my kitchen space so I just used the bass boost circuit in the receiver and the sound is pretty good in the upper bass and very good from 100 Hz up. My wife is very happy, and I am a hero for giving her the stereo she wants. Yes, I am a Marantz dealer, and a Gallo Acoustics dealer. This entry was posted in Bookshelf Speakers, CD Receiver, Gallo speakers, Marantz CD network receiver, Network receiver and tagged A'Diva SE, Bel Canto Design, Gallo Acoustics, Marantz M-CR603. Bookmark the permalink.